To develop these resolutions, Congress participants were invited after each morning and afternoon session for three days to use Individual Reflection Forms and to share in Discernment Sessions in small groups and submit Table Group Reports. 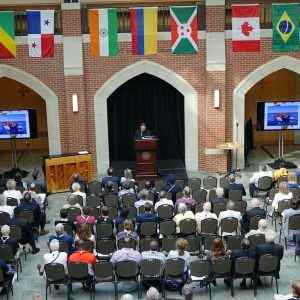 The responses reflected key insights and highest hopes for actions flowing from this WUJA Congress for living the Jesuit mission in a concrete way in our lives and in our communities around the world. giving to lay persons, particularly women and young people, a place worthy of what they can bring to evangelization. Warmly thanks Father Arturo Sosa S.J. for his presence at the Congress through the teleconference, and for his enthusiastic encouragement to the actions of the Alumni, and assures him of its support for the pursuance of his mission and of its availability to carry out any task he would like to entrust WUJA with. Thanks the WUJA-USA Board Members and the Conference Committee for their efforts to achieve a congress characterized by the innovative design of the conference intended to meet a diversity of interests, the excellent care and service of the organizing staff, an atmosphere of warm friendship, and the high quality of its keynote speeches and concurrent sessions. Assures the organizing committee of the 2021 World Congress in Barcelona of its enduring support to make of this Congress a great success. Convenes a “year of discernment” for itself to define a common vision and mission for Jesuit Alumni around the globe that can create the way to achieve a deeper unity and a stronger network. Will explore the development of a global knowledge platform utilizing an optimal technology approach that provides access to all Jesuit resources and enhances the ability to communicate. Stresses the importance of the idea of “Men and Women for and with Others”, reflecting on the importance of building friendship and the sense of community. Encourages Alumni associations to provide more opportunities for formation in Jesuit spirituality, in particular through the Spiritual Exercises, giving special attention to young Alumni as well as to the promotion of Jesuit vocations. Urges its Alumni to instill in their lives a gentle tension as requested to them by Pope Francis, in the sense of a desire to change, even when everything is going fine for them. 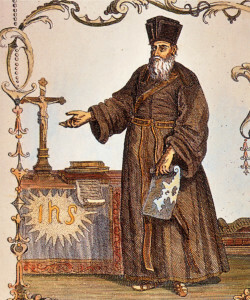 Advocates for the promotion of activities of the intellectual apostolate that transform “words into deeds”. Encourages the Alumni to engage more in the care, support and education of refugees. Encourages the Alumni to resolutely engage in ways of placing the care for the environment, as described in the encyclical Laudato Si, at the heart of the actions they undertake at the level of education, social work, business and citizen engagement. Wishes to help the Society of Jesus and its lay collaborators to create for its schools, colleges and universities the new Ratio Studiorum that our 21st century needs. Encourages its Alumni to keep alive and to promote the memory and the legacy of Father General Pedro Arrupe S.J., who influenced greatly the Alumni movement. Reiterates its support to the establishment of a business school for the Great Lakes region in Africa in cooperation with the Society of Jesus, with the adequate academic and corporate partners, mandating its Council to investigate the opportunity of launching such a school in the countries pertaining to this region, possibly under the form of online education. Would like to extend its gratitude to Sam Guarnaccia, the composer of the Communion reflection O’er Every Living Thing, which premiered at the closing liturgy for the 2017 WUJA Congress. Additionally, WUJA would like to thank Sam Guarnaccia and the promoters and organizers of the Emerging Universe Oratorio for having created a most beautiful piece of music, spiritually and intellectually, as well as for having gratified the World Congress of WUJA with a premiere of this work with full orchestra.